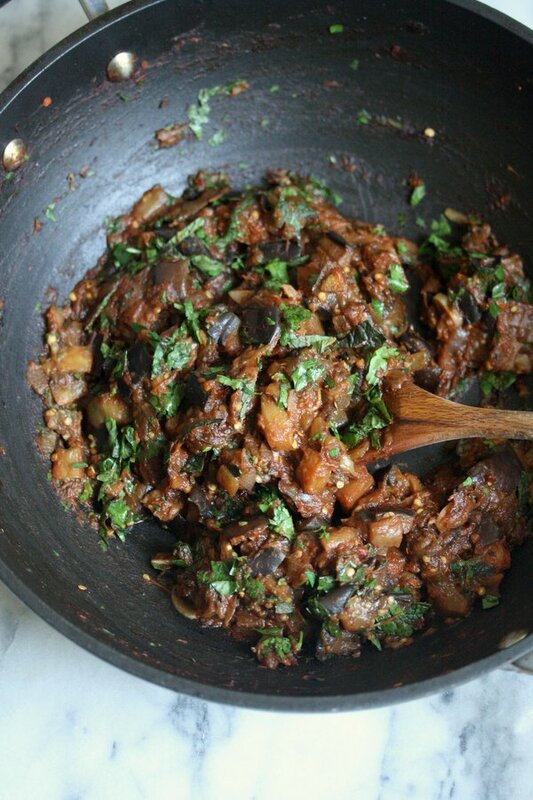 Eggplant caponata always brings me back to my semester abroad in Rome. The cramped three-bedroom apartment I shared with six other students was where a lot of my small kitchen experiments began. Our galley kitchen probably had less counter space than my current Manhattan studio, and barely contained enough silverware and plates to feed all the roommates at once. And yet, being budget-conscious students in an overpriced touristy part of town, we didn’t have much choice but to visit the nearby outdoor market in Campo dei Fiori and cook for ourselves. I wrote a little essay in my cookbook called The Crostini Consultant about the dinner parties my male roommates attempted to throw. They would emerge with just a few undercooked chicken breasts that were meant to feed a dozen kids seated on our floor getting drunk off of supermarket jug rosato. Bless their hearts. Inevitably, I would be called in for culinary damage control. The solution? Pane rustico, sliced thin and topped with a simple eggplant-tomato spread. 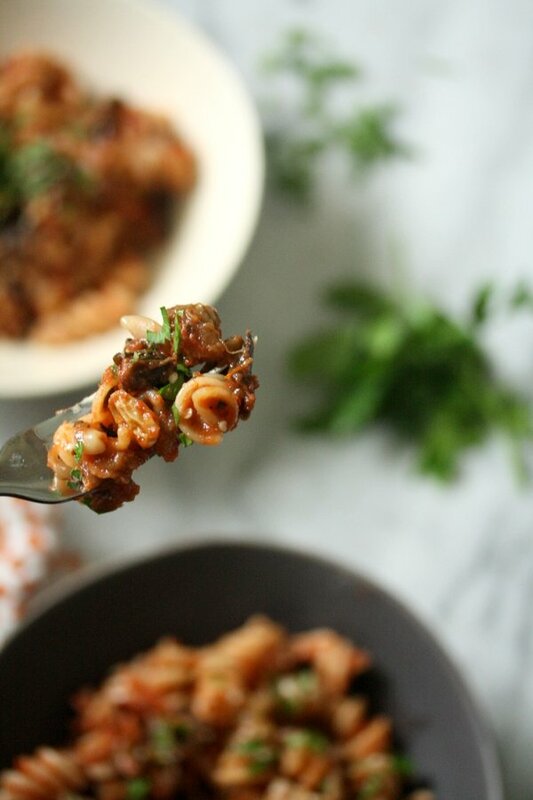 Even without two clueless boys as my sous chefs, eggplant caponata is still one of my go-to recipes to feed a crowd of friends. Today, I sadly don’t have the luxury of stretching it with crusty bread. But luckily, I have the budget and the cookware to accommodate getting more than one eggplant involved. When I was brainstorming recipes for our Friends In Food dinner last month, naturally the caponata came to mind. So I decided to put a little spin on it with some of my favorite spices from the veggie salads I ate in Morocco. I served the Moroccan eggplant caponata on top of Mary’s Gone Crackers as a second appetizer option alongside this Roasted Beet Hummus. Since the potluck buffet was much more abundant than our table ever was in apt 3F, and the food blogger crowd had a lot more restraint than twelve teenagers drunk on jug wine, I ended up coming home with half of the Moroccan eggplant caponata. 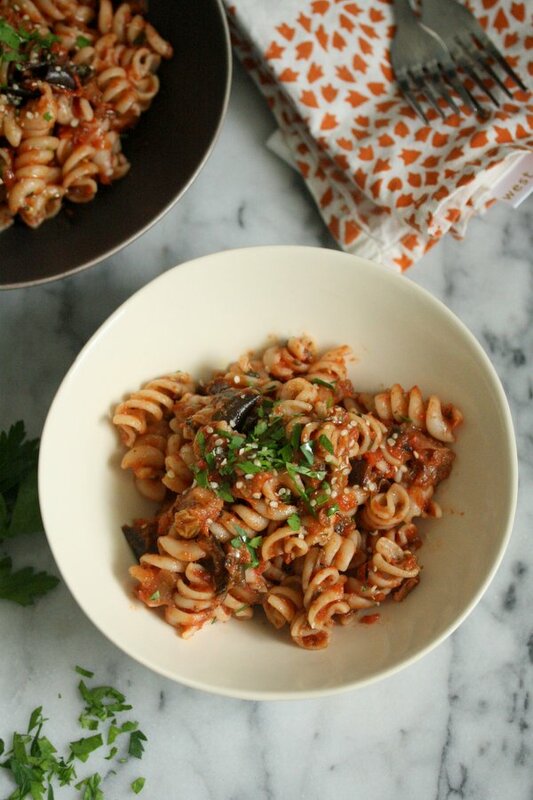 And since I am now in the position to not have to hide my leftovers underneath a block of molding pecorino, I enjoyed the remaining eggplant for the rest of the week as a topping for gluten-free pasta. The combination was so good, I thought I’d share this leftover recipe miracle with you all. 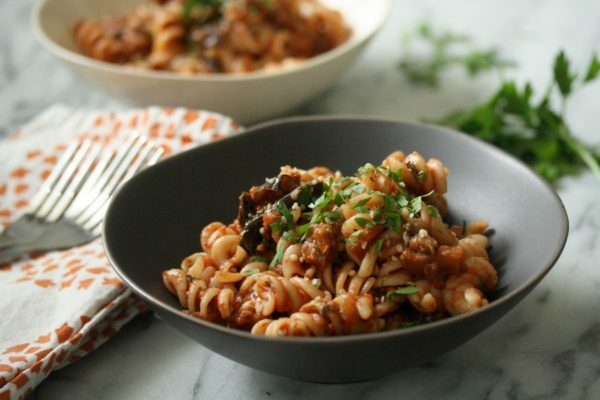 The spiced eggplant caponata pasta with sweet golden raisins and fresh parsley is the perfect simple weeknight meal to serve hungry friends, even if there’s no jug wine involved. 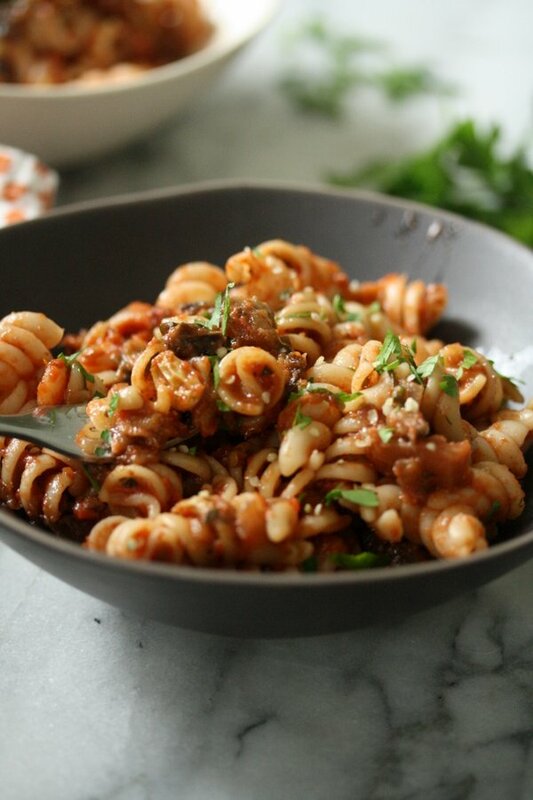 8 ounces gluten-free fusilli or other short grain pasta I used Andean Dream. In a large nonstick skillet, heat the olive oil. Saute the eggplant over medium-high heat until beginning to soften, about 8 minutes. Add the onion, and continue to cook, stirring occasionally, until the onion is translucent and the eggplant is tender and beginning to brown, another 10 minutes. Stir in the garlic, salt, cumin and cinnamon, and cook until fragrant, 1 minutes. Carefully pour in the tomatoes, scraping up any brown bits from the bottom of the pan. Simmer until thickened and the tomatoes have lost their acidic bite, 8 – 10 minutes. Remove from the heat and add the raisins, lemon juice and parsley. Meanwhile, cook the pasta according to packaged directions until al dente. Drain well and fold into the eggplant mixture. Serve immediately, cold, or at room temperature with a drizzle of olive oil and some toasted almonds or hemp seeds for garnish. This is very similar to one of our favorite recipes Phoebe! We never tried adding cumin and cinnamon in this dish before though. And this is definitely VERY interesting. We usually add cubed feta at the end, and your lemon-parsley suggestion (combined with the cumin) sounds like a great alternative! We are blessed with having a steady production of organic eggplants each summer (from Panos’ parents garden) and we’re always looking for new recipes/ideas to use them:) And this idea is fantastic! We’ll use less cinnamon though, as we’re more accustomed to using it in sweets:) But it does taste good with eggplant and tomato, you’re right. 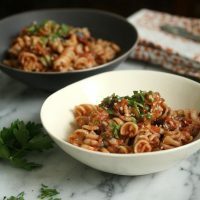 This will taste awesome with some whole wheat pasta we have in the pantry, as we’re not gluten free dieters ourselves. Lots of greetings from both! 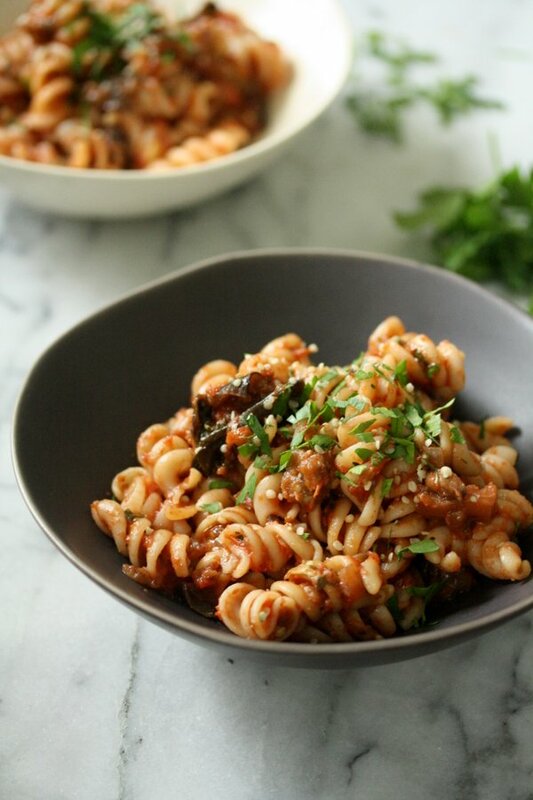 I love the sound of this – such a great change up from my standard pasta dishes and such a great way to use eggplant. Love the Moroccan spices that you’ve used too. Thanks Kathryn! 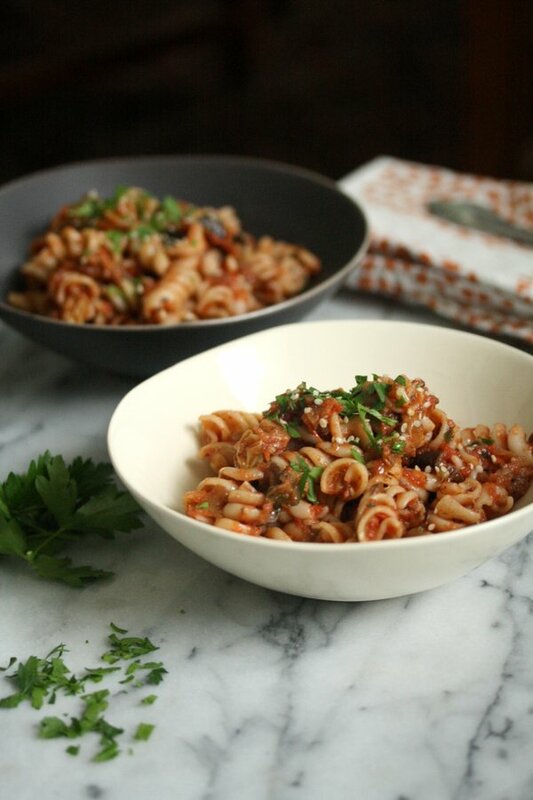 I hope you get your hands on some aubergine and try it! 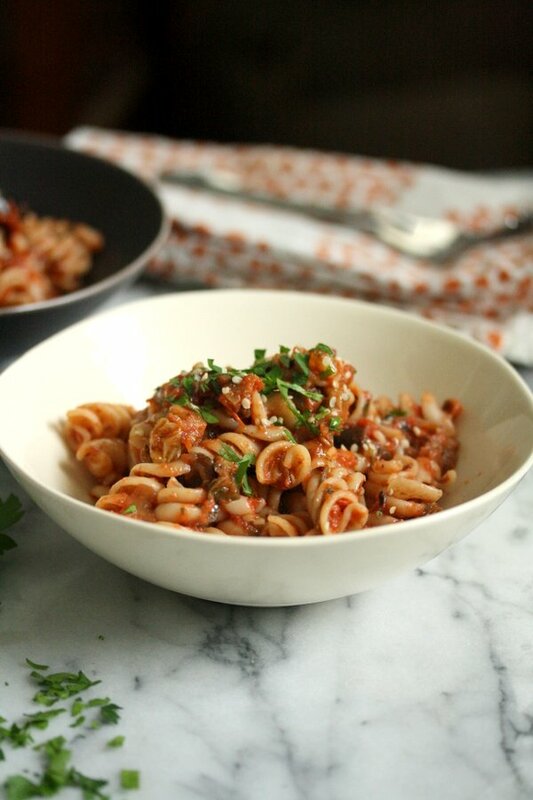 We are big fans of meatless mondays, though this pasta seems simple enough to put together any night! Especially love your addition of cinnamon, so unique! Moroccan flavours are the best. I love how you’ve incorporated them into a light summer pasta salad. Looks perfect, Phoebe! Thanks Nancy! It just gives the eggplant a little somethin somethin. Let’s hear it for the cinnamon! Is there a trick for extracting the bitterness from the eggplant? hmmm I think salting helps to some extent, but I also don’t find eggplant particularly bitter. Maybe it’s something about them in Jamaica?? I hope you love it Amy! Phoebe – I want to try this but I can’t find it on your pinterest boards and when I try to pin it to my “new” Phoebe board, it won’t pin. Any suggestions? I went with my instincts and this was delicious and so easy. I used only 1/2 the amount of pasta and made it into a dinner for two. Thanks again. I’m so glad you made it Marry! Sorry for the delayed response on the raisin front. You can’t really go wrong, so I’m sure your dish was awesome! I’m so sorry for not including this! Will update the recipe now. Great catch and things for making it so quickly! Delicious. Love the spices. Omitted the raisins. Great use of eggplant. Would definitely make again.